I just bought my first AR-15. It has an 18" long heavy stainless barrel with a 1 in 8 twist. 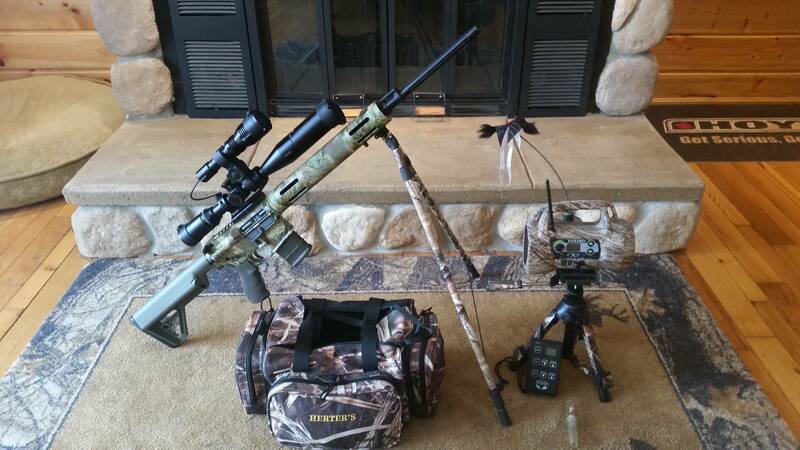 I plan on shooting coyotes, hopefully long range. I equipped it with a Nikon M-223 scope which has a BDC-600 reticle with hold-over marks out to 600 yards calibrated for the .223. 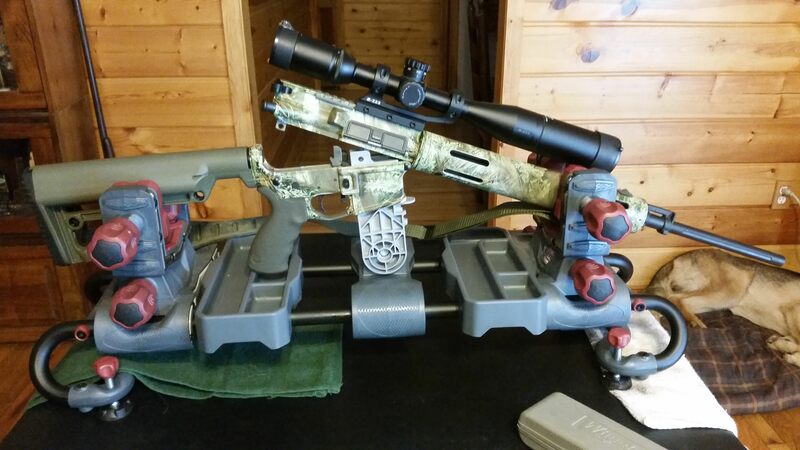 I realize 600 yards will be out of my capability, but I would like to shoot out to 200-300. How heavy of a bullet should I be shooting? I read that some bullet weights are more compatible with certain twist rates than others. I'm thinking I will need a relatively heavy bullet to maintain down range accuracy as well as kinetic energy. Your thoughts? 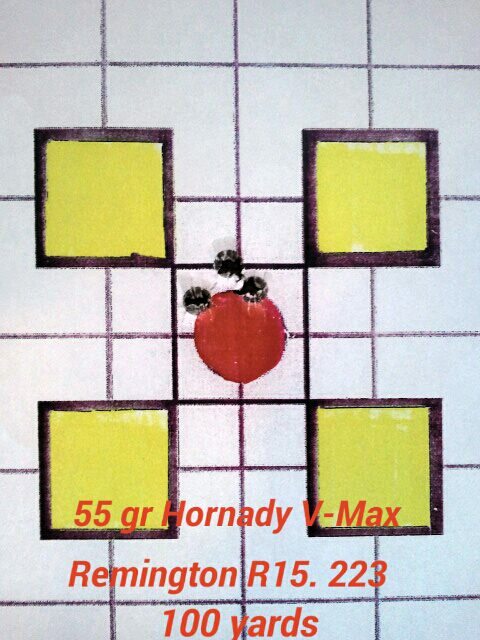 I just run 55 gr Hornady V-Max out of my R-15 and have no issues shooting consistent sub MOA (.25) groups all day long. 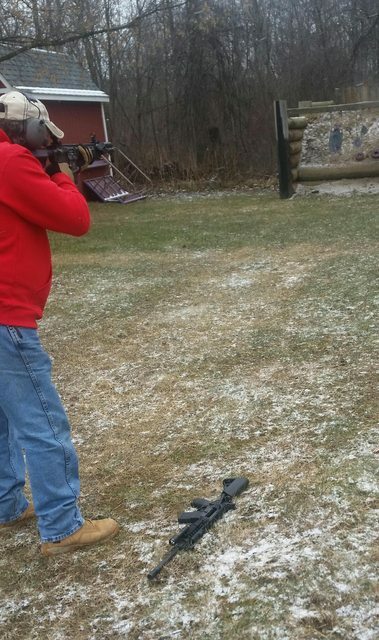 Farthest one shot kill on coyote was 418 yds., right in the wheel-house. Got several 230+ one shot kills as well. 150 and in is pretty much a chip shot. So I don't see any reason to shoot a heavier bullet. I have the Nikon M-223 scope, too, but with the rapid target turrets. 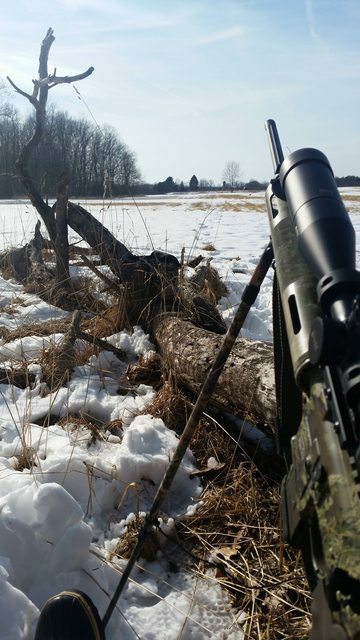 Great scope for the .223/5.56. 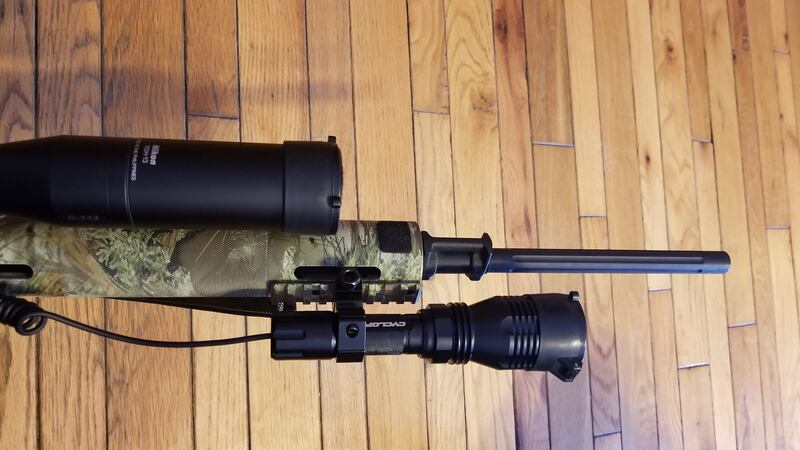 It's mounted on the Nikon M-223 one piece scope mount. I did install a Timney single-stage skeletonized 3# trigger, a RRA Operators stock, a Sprinco buffer spring, a BCM Ambi charging handle, a MagPul enhanced trigger guard, ERGO pistol grip, and a MagPul BAD (bolt assist device). 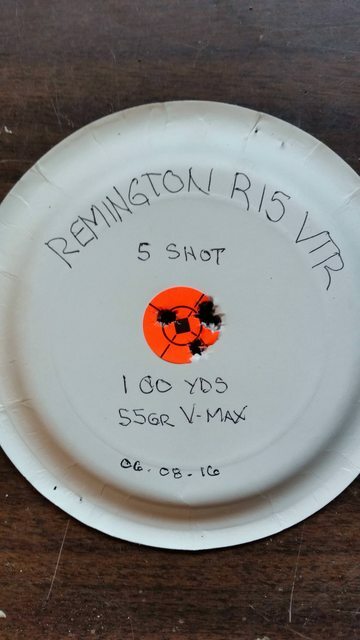 If I were you, I'd just start out trying 55 gr. and see how you rifle likes those before trying anything else. Last edited by BowKil; 06-26-2018 at 02:26 PM. Oh yeah, I repositioned my night light on the fore end insted of on the scope. Much better! 238 yds. One shot and it dropped like a rock in it's tracks. Last edited by BowKil; 06-26-2018 at 03:59 PM. BowKil, Thanks for the recommendation. Nice set-up. Looks like a long barrel. How long and what is your twist rate? My gun is the RRA ATH, and I like it alot. BTW I noticed the Hoyt cap. I hunt whitetails with a Carbon Element. Thanks. It has a 22" 1/9 twist, Free-floated button-rifled 0.680" Muzzle OD fluted bbl. 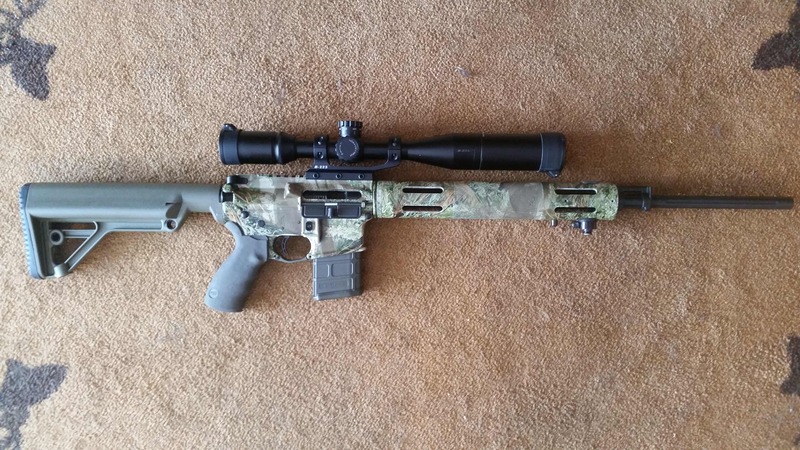 RRA makes a damn nice rifle, and the ATH is a nice set-up. A Hoyt brother, eh? Atta boy! I'm still shooting my two '14 CST's. Haven't found anything newer that I like and/or shoot any better. Give the 55 gr a try first like I said. You might be surprised. I have a DDM4 carbine with a 16" 1/7 twist and it'll shoot the Hornady V-max MOA easily. With 55 gr ball ammo (various brands and brass cased), it'll do 2.5" at 100 yds. Last edited by BowKil; 06-29-2018 at 05:58 PM.